You work hard building the reputation of your dental implant practice. And assuring patient satisfaction is always a top priority. But, let's say one of your patients enjoys an above-average experience at your office. Are they leaving positive reviews online? We can simplify the review process for your patients to help you build a wealth of helpful online reviews. What's more, you can then stream positive reviews automatically to your website or social channels! 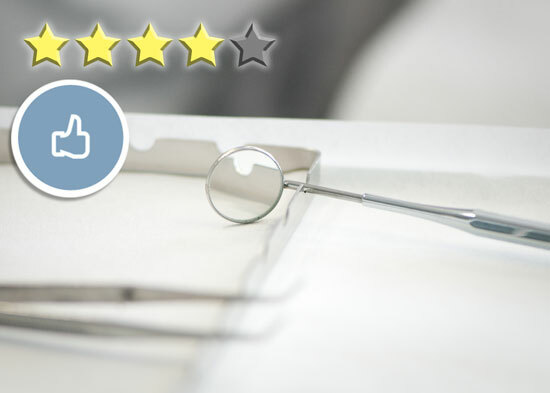 Patient reviews are the single most effective bit of healthcare marketing you can do for your dental care practice. So, how do you capture them and then capitalize on them? Let's face it: online reviews are increasingly influential, and your prospective patients are more empowered than ever before. That's why acquiring more happy patient reviews is one of the best marketing ideas for dental practices. Before they even step foot inside your office or make an inquiry about your services, chances are your prospective patients have already educated themselves online. So, let's make it easier for happy patients to leave positive reviews! And then, let's give those positive reviews more exposure. The first step to a stronger patient review base, is to acquire more authentic patient reviews. Reviews from reputable online sources, like Yelp and Google+. Why don't your happy patients write reviews? They (a) never think to do so; (b) forget to do so; or (c) don't know where or how to do so. We can help! Let's create a "review funnel" process for your business to ask, remind and guide your patients through writing a reviews on the sites you care about—and intercept unhappy patients before they bad-mouth your practice online. By automating the way your business gets reviews from multiple channels and collecting them in one place for easy monitoring. By optimizing the number of reviews your company gets on Google, Facebook and the industry-specific review sites that matter to you. What if you could reach an unhappy patient and address their needs before they get a chance to bad-mouth your practice online? Our system will give you the time and information necessary to help turn a negative patient experience around. Which might create even more positive reviews. Are You Making Your Patient Reviews Count? Our team will determine if you have a user-friendly customer review system in place, if it is mobile device friendly, and if your online profiles are incomplete or unclaimed.